Front and center industry analyst disclosures: Your trust is important to us, as such, we strive to disclose our client relationships, some which are listed in the following post, read Altimeter’s disclosures page. Social Media Management Systems, like CMS systems for websites, these SMMS systems (see list of all vendors) help companies manage, maintain, and measure thousands of social media accounts, are the next growth market for the social business category. While saturation is at 58% of corporate buyers, the average deal size is a meager $22,000 but will expect to grow to six figure annual deals in coming quarters to meet market demand. This growing space has low barriers to entry, which result in a flood of clones, but expect only a handful to remain after a shakeout to serve enterprise-class buyers. Buyers and investors should focus on vendors that understand business –not just technology, offer services and reliable SLA, and deep integration with other social systems. In the future, this technology set will mature to grow into a data company that will extend it’s scope beyond simple Facebook and Twitter and impact how marketers approach the market, product innovation, and supply chain. Year One in Review: New Entrants, Acquisitions, and Growing Deal Sizes. Growth rates rose 11% from corporate buyers. In 2010, adoption of SMMS systems by corporate buyers was already at the 52% and in 2011 buyers indicated they will be at the 58% adoption rate. Deal sizes grew 57% in last year. While there was significant relative increase in deal sizes the overall average annual deal size per corporate was $14,000 in 2010 and rose to $22,000 in 2011 according to our research of 140 corporate buyers. 65% Increase in vendors in last 12 months and growing. When I started this list, there was 15 vendors after launching the list after the first week. Today, the list has grown to 23 vendors (and I’m continuing to add vendors, with a market growth rate of 65% increase in new entrants, this will only continue this year. Growth markets in consumer facing and large corporations. While I noticed that Telecom and Tech were early adopters, I’m seeing growth opportunities in Retail, Hospitality, Restaurants, Consumer Tech, CPG, and all Regulated Industries. Consolidation: at least three acquisitions. CoTweet was recently acquired about a year ago by marketing platform ExactTarget, months later Objective Marketer was acquired by Email Vision, and just in this past Feb Constant Contact acquired SCRM company Bantam Live which has some SMMS features, all which are email/direct marketing solutions. Among all these acquisitions, we’re seeing these tools tie into greater marketing platforms for additional value. Some early forerunners –but don’t expect a clear winner. I’ll do more detailed analysis on these vendors later, but right now I’m hearing from buyers the following vendors: CoTweet, Hootsuite, Sprinklr, Spredfast and newer entrant Expion. Interestingly, former Community Platform vendor with enterprise experience Awareness Inc has double downed on this market and shifted away the saturated community platform market by launching Hub. Early vertical focuses have emerged and partnerships. We’ve already started to see verticals appear, such as GOSO for the Automotive dealer space, and expect this to continue in specific markets like hospitality, restaurants, travel, CPG, and Retail. Another new entrant was an entry by initially a consumer tool Seesmic, who received funding by Salesforce –the first enterprise vendor now with integration with social aggregation tool Chatter, and now Yammer. There was only misfire, as KeenKong changed their product strategy and never launched in this market. The target market is hospitality, retail, and CPGs. Each of these corporations has dozens to hundreds of unique brands, and then regional rollouts. For example, some hotels could have up to 15 brands, and each having 4,000 hotel locations (half being distributed franchises), each with 10 social media accounts (there’s more to the social web that Facebook and Twitter, across a variety of languages. Furthermore, there’s high turnover in the localizes marketing and sales manager, who also lacks a background in online communications. In the last few months, we’ve seen some severe examples of mis uses of corporate social accounts which could have been prevented by having a process and toolset to support (see the long list of “punkings“). In particular, Kenneth Cole’s ill-fated tweet tying the Egypt situation with spring sales was met with a riotous reaction, and last week’s Chrysler’s F-Bomb tweet resulted in firing of an entire agency. As a result, expect that many regulated companies will demand compliance regulations with social media, and be mandated to invest in SMMS systems to preview, flag, an process content before it’s published. Of course, this brings forth a few challenges such as less real-time approach, and a more sanitized corporate approach to discussions that will ultimately decrease credibility as authenticity may waver. Similar to the mess-ups listed above by Kenneth Cole and Chrysler will cause regulatory industries to give pause on how employees will use these technologies. As a result, expect healthcare, pharma, insurance, auto, finance and beyond to start looking at using these tools for all employees and even corporate accounts. Expect a keyword filtering system and workflow to be put in place to monitor then recommend a course-of-action to correct deviant tweets and Facebook messages. The downside? The rapid pace of the real world conversation will be slowed for many, but expect seasoned veterans to unleash the SMMS shackles for open conversations. This toolset is an attractive addition to existing direct marketing platforms like email marketing suites that are used to publish thousands of emails to customers on a daily basis. Direct marketers, who want to get on the social bandwagon are finding religion and are now blasting content on social channels to networks comprised of news, deals, and offerings with mixed engagement and interaction. The social media service industry knows they must be value added beyond strategy and community management. They are seeking recurring revenues for accounts on a monthly basis in order to glean the hundreds of thousands per client, see data to learn more. By using SMMS systems, often coupled with brand monitoring and reporting services, they are now able to be full-service to listen, engage, and measure how companies are interacting with their customers on social channels. By partnering with SMMS systems some are white labeling the service, and using this in front of clients as a value added software, suggesting a perceived lock in with data and reporting –giving agencies the opportunity to become the Social Media Agency of Record (SMAoR). First, understand how SMMS fits into the overall Social Business stack. You’ll notice it’s a sister technology to the technology “aggregation” displayed to the left of it. You’ll also notice that it’s below brand monitoring firms, and sits on top of Social Platform technologies. To the left of it you’ll find it is part of the data story in infrastructure and to the right of it services. Other places to watch for acquisitions will be social commerce platforms, as well as marketing automation platforms as they must spread into this space at a rapid pace to glean the revenues. This One-Year Old Space Shows Parallels to the 5 Year Old Community Platform Space Similar to how in 2007, how we saw trends for the Community Platform market, labeled it, and went on to research the space, I’m seeing similar trends (entrepreneur styles, deal sizes, market saturation) in this early SMMS market, just one year in. Vendors startup mentality clash with real buyers needs. Many of these garage startups lack understanding of corporate buyers. Not uncommon to seed, angel, and A round vendors, a majority of these vendors lack corporate buyer perspective. To learn more about the buyers of SMMS read the report about the Career Path of the Corporate Social Strategist. Vendors will finally offer and enterprise class service level agreements. Mainly focused on platform development, and also being discouraged by investors to add services to the mix, most of these vendors lack the staff to serve a corporate buyer who needs a high degree of hand holding in social business. Better yet, read Petra Neiger, one of Cisco’s Corporate Social Strategists perspective on what’s needed for buyers. Analytics and reporting to be a core focus on 2011-2012. These early platforms are focused on management of the social channels, and most do not have strong analytics and reporting technologies. Furthermore, they are often not connected to other reporting systems, and are data silos. Expect corporate adoption to reach 90% within three years . Expect market saturation to hit 90% range in three years, and average deal sizes to exceed $100k per year on average corporation –just as the Community Platform space have experienced over the past five years. Vendors that can align their product roadmap to the SMMS maturity roadmap stand to be one of the standing contenders. Deal sizes will reach six figures on average. I saw this trend before with the $25-50k deal sizes with community platforms about 5 years ago and have watched them balloon to $200k-300k for advanced and larger corporations on an annual basis. I expect similar patterns to emerge here as new functionality is offered and as the SMMS connects to other systems for lock in. Right now the average SMMS deal size is a mere $22k, yet as we segment out corporations with high revenues (over 10 billion, annually) they are already clinching $68,000 deal sizes –remember it’s only year one. 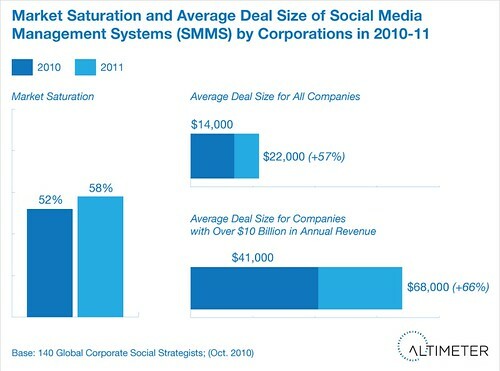 Read more about how corporations should spend on social business. Market will reach over 100 vendors. Just like the crowded brand monitoring space (150 vendors) and community platform space (125+) vendors expect this category go balloon due to low barriers to entry, VC funding, and commodity technologies. In the long run, only a half of dozen will matter to the enterprise, as market consolidation will occur. Expect the 90+ that don’t become first of mind to corporate buyers to head into specific market verticals and SMB focus. Well that’s my perspective after watching this space for the last 12 months, while I’ll continue to give updates, expect another wrap-up next March in 2012.